The Ukrainian Historic Towns Atlas project was established in 2014. The aim of the project is to record the development of a selection of Ukrainian towns both large and small. Each town is published separately as a fascicle or folder and includes a series of maps complemented by a detailed text section. The Ukrainian Historic Towns Atlas is part of a wider European scheme, with towns atlases containing broadly similar information available for a number of countries. Ukraine became the 19th country that joined this project and the first non the member of European Union. At an international conference on ‘Historical Atlas of Lviv: Maps, Texts, Reconstructions’, organised in 2012 in Lviv (Ukraine), the idea of an Ukrainian historic towns atlas was first publicly discussed. Prof. Anngret Simms (Ireland), Ferdinand Opll (Austria) and Kataline Szende (Hungary) as the members of the Working Atlas Group, and prof Roman Czaja and Zdzislaw Noga (Poland) took part in this conference and helped in realization of the Ukrainian Atlas. In January 2014 the first volume of the Ukrainian Historic Towns Atlas was published with preface of the Michel Pauly, President of the International Commission for the History of Towns. In accordance with the program of the International Commission for the History of Towns four plans are obligated for each atlas: a) A cadastral map of the nineteenth century, to a scale of 1:2 500, but redrawn with clear contours representing the town as closely as possible in the pre-industrial era, ie before the industrial revolution and significant changes in the urban landscape; b) A plan for the same period of the city and its suburbs, which allows us to see the development of urban networks around the city (scale from 1:25 000 to 1:100 000); c) A modern town plan to a scale of 1:5 000 or 1:10 000, which can trace changes in spatial development in the industrial age; d) A growth to a scale of 1:5 000, based, where possible, on the cadastral map, shoving changes in the city’s territory from its foundation to the present day. The Atlas contains reproductions of historical maps, when selecting which is taken into account first of all the originality and novelty of surveying topographical material. Some views of the city complement our knowledge about urban development, giving a visual three-dimensional picture. 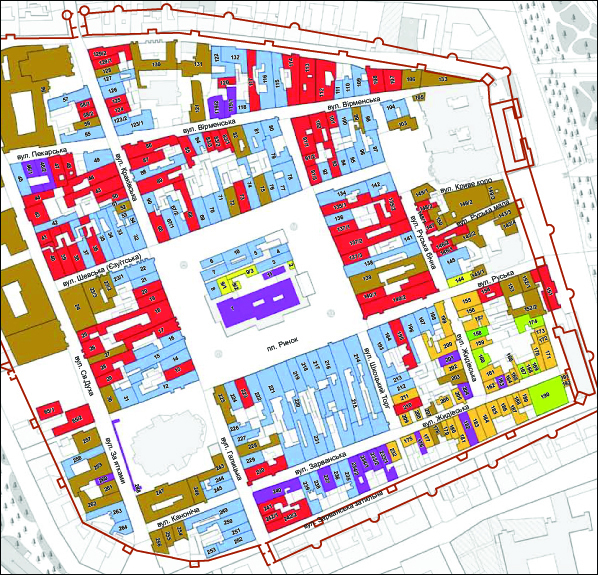 Maps reconstructions contain modern scientific information on past urban landscape (sacred buildings, fortifications, archaeological sites, etc.). The project is realized under the patronage of the National Academy of Sciences of Ukraine. Main institutions involved are the Lviv Branch of the M. S. Hrushevsky Institute of Ukrainian Archeography and Source Studies, the Scientific and Research Center «Rescue Archeological Service» of the Institute of Archeology, Institute of Geodesic Information Systems (Lviv) and others. Prof. Myron Kapral (Lviv) became the scientific editor of the first tree atlases. There is no any staff employed on this project. Periodically cartographers are employed on specific atlases. The compilation of material for each atlas is the responsibility of contributors drawn from a variety of disciplines, mainly geography, history and archaeology.